Over the last few years I've developed a real fondness for working in black and white. I've always loved looking at great black and white photography but was so drawn to color that it was, by far, the medium in which I enjoyed working the most. I photograph what my eye is drawn to and, for quite a few years, my eye was drawn primarily to color. I suspect that's the same for most folks and, of all the design elements, color really moved me. My preference for working in color is not as strong as it once was. These days I'm happy to let the image suggest to me how it should be processed and whether it's best suited to rendering in color or black and white. If black and white seems to be the best outcome I work to compose the image so as to enhance the compositional elements such as line, shape, texture and repetition within the frame. St. Petersburg is a very beautiful city and visiting the spectacular Church of the Savior on Spilled Blood featured in the above photo was an exhilarating experience. My first response: wow! The murals, which form the basis of the church's interior decoration are a visual delight. Their vibrant colors are illuminated, at least during daylight hours, by a mixture of natural (i.e., daylight) and artificial (in this case tungsten and incandescent) light. Your first impression, upon entering this church, is likely to be governed by color. And, as color is so essential to your experience, that's probably a good enough reason for staying in that medium. A spectacular horse sculpture and the magnificent St. Isaac's Cathedral, St. Petersburg, Russia. But not all scenes feature such vibrant color. What's more, regardless of the reality under which you find yourself making photos, a more subdued color palette may better suit the needs of the photo you're creating. 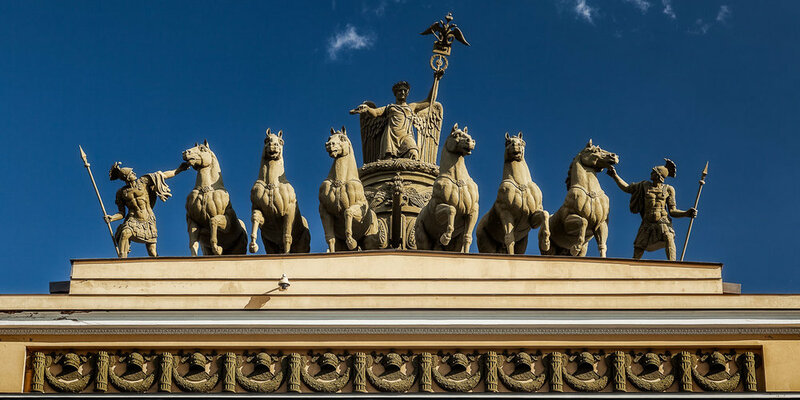 That was the case with the above photo of the horse sculpture outside the magnificent St. Isaac's Cathedral in St. Petersburg, Russia. It would have been so easy to produce a more striking result by saturating the blue and yellow colors in this image. But, somehow, that didn't seem right. I made the image as the sun was going down. The quality of the light reflecting off the surfaces of the sculpture and cathedral was gentle. It felt right to retain that mood while processing the image on the desktop. My recommendation is to follow your heart, by which I mean your initial emotional response to the subject or scene in front of you. Of course that initial emotional response is stimulated by your senses, one of which is sight. But try not to be overly influenced by what you see in front of you. Rather try to tap into how you feel about what you see and allow that feeling to influence you in the way you go about making the photo in camera and, where appropriate, on the desktop. If you're drawn to color then photograph colorful subjects and scenes and be sure to make color, whether it be muted or saturated, the main element of your composition.